Hi DIYers! Recently, we paired an Alarm.com Security Camera with our Alarm.com account so that we could try viewing it through a Qolsys IQ Panel 2 Plus Alarm System. We gotta say, we're extremely pleased with the crystal clear recording capabilities, and we're sure that you will be too! Streaming video directly to the panel from Alarm.com is a feature available for both the standard Qolsys IQ Panel 2 and the Qolsys IQ Panel 2 Plus Systems. The system just needs to be running firmware version 2.2.1 or higher, and the user needs an alarm monitoring plan with video surveillance that is set up with Alarm.com. For Alarm Grid customers, these are our Platinum Level Plans. Additionally, the ADC-V521IR and the ADC-V522IR can support two-way audio as well. 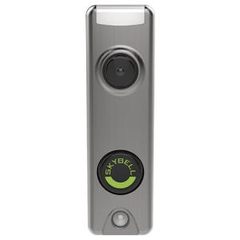 For our testing, we worked with the ADC-V522IR 1080P Indoor Security Camera. We were amazed with the quality of the video, both through Alarm.com and from the panel itself. The two-way audio functionality worked great as well. If you don't believe it, just see for yourself. Here's a quick photo taken of our IQ Panel 2 System as it streams live video and audio. Yeah, our support room is a bit messy, but bear with us! The key point here is that the quality looks absolutely tremendous for an easy-to-use security camera. 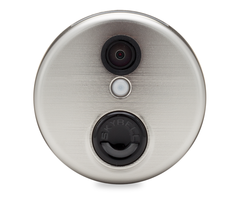 Just imagine putting one of these cameras in your home and streaming directly from Alarm.com and your IQ Panel 2 System! We have to give it to Qolsys for creating such a versatile alarm system with this outstanding feature. Now you can view your ADC Camera from Alarm.com when you're on the go, or from your alarm panel when you're at home! You can get the Qolsys IQ Panel 2 or IQ Panel 2 Plus and many great Alarm.com Security Cameras from the Alarm Grid website. If you ever need any help deciding please reach out to us any time at support@alarmgrid.com. You can also call us during normal business hours, which are 9am to 8pm EST M-F. We look forward to hearing from you!